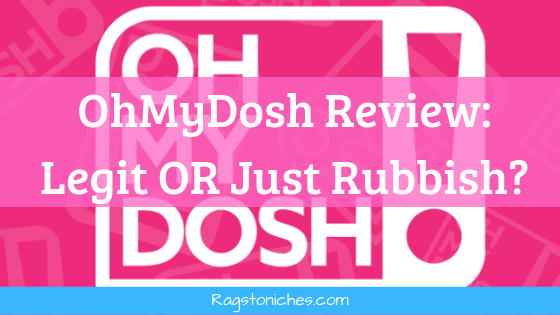 I was recently introduced to OhMyDosh as a pretty new rewards site based in the UK. But what is OhMyDosh… A legit site where you can make money? A scam? Or is it just plain rubbish? Overall Verdict: This is a legitimate website, where you can earn a small amount of cash for signing up to trial offers, paid offers and free offers. With a limited amount of good quality reward sites that are purely based in the UK, I was pleasantly surprised by this one. Sign up here & get a free £1 bonus. OhMyDosh was started by the same company that created the 20cogs website, (another one that I quite like). The main way you can make money here, is through offers in various forms. Offers are often in the form of trials, you sign up to a free trial, (for example) and get a reward for doing so. Some offers simply involve saving a bit of money, or getting a discount. An example of an offer may require you to sign up to an online casino and bet £10, but then you’ll get more than that back in return from OhMyDosh. So, while some offers require you to pay something, you usually make a profit overall, (or your money back… but every offer explains the details!). At first I thought they had paid surveys available on this site as well, (which would be a good addition) but instead you get paid a certain amount for signing up with external survey sites. The issue with offers is, you need to be very careful to follow the conditions of the offer and also cancel any free trials before you’re charged. Sometimes you may have to agree to your details, (such as email and telephone number) being passed on to third parties. This is why I would always recommend setting up a separate email account for websites like this. It’s always a good idea to carefully check the T&C’s of the offers you complete as well. So many sites similar to this can come across as a bit dated. But it was nice to see that OhMyDosh has a modern and fun design and it’s easy to find your way around. There are also plenty of instructions to help, if you’re not sure what to do. If you’re like me and have already signed up to a lot of sites like this in the past, then you may find it harder to find offers you can do. Many sites tend to have many of the same ones, although I still found some that I could do. Typically, you get the most for casino/lotto type offers, so if you enjoy trying out new online casinos – this is a good way to do it. Related – Make Up To £500 Profit A Month From This. What Type Of Offers Do They Have? Obviously, the offers available are subject to change and will change at regular intervals. Join Gala and spend £10 – but get £15 back. You can find the type of offers you want, by scrolling through the side-bar. For example; some are organised into: Hot offers, Surveys, Free, Gambling, New Offers, Competitions, Utilities and more. How Do You Complete An Offer? Simply choose an offer that looks good and click on the green button below the offer, that says how much you can earn. If you click on the link, it takes you to a new page that will explain all the steps you need to take. It’s important to read and follow all the steps carefully, or else you won’t get your reward. So, in this case, you’d need to join the site, deposit £20 and play through all that money, (including any bonuses). You can then get a £25 reward – so, £5 profit, plus any winnings you may potentially make from the site. As I mentioned previously, gambling offers have some of the highest payouts – but there are plenty of other types of offers you can try. How Do You Get Paid With OhMyDosh? You need to make £10 before you can get paid. The options right now are either PayPal, (which is quickest and easiest)… Or direct into your bank account. If you invite your friends and family to OhMyDosh, you can earn £5 as soon as they first withdraw £10. You can invite as many people as you like. Easy to navigate & fun design/layout. £1 bonus for signing up. Low cash out threshold of £10. Offers can lead to SPAM – it’s best to take precautions to avoid it. Still only a pocket money opportunity. Many offers more like a discount – for example , the first month of a membership for 99p, or £15 off when you book a hotel break. If you’ve done a lot of paid offers in the past, you may find many that you have already done, (I still found a bunch I could though!). Ohmydosh is doing pretty well at keeping people happy and currently has an impressive 5-star rating on Trustpilot. Get a £1 bonus for signing up here! Yes it is! You’re not going to make loads of money, but you can both make and save money on products. You can also get to trial products that you may not have tried otherwise. I recommend trialing Amazon Prime – I pay monthly and so, I was unable to do that offer! Which was a shame, as it paid £4!!! Also, if you’re into online casinos, lotto, or bingo – then this is a great opportunity to trial some of those sites for free, (with a potential of winning too!). You can make £1 here, for signing up – so, you only need to make £9 to take out your cash. Beyond Cash Offers Online – What About Making Money? If you want to make money in the long term and are interested in starting your own online business… there is no reason why you can’t! While I have made money online in various ways – from entering thousands of competitions a month, to print on demand, surveys and paid offers…. But I make the most right now from having my own website – and primarily make money from affiliate marketing and advertising. I didn’t have a clue how to do any of that when I started, but this training showed me how and explained it step-by-step. You also may want to check out my 40+ ways to make money online.